I have 57k on my factory LS2s, and they're getting a little worn. Trying to decide whether to go with another set of these, or something else. I've had a good experience with the LS2s, no shaking or anything like that. I could probably get 60k+ out of them, but I'm thinking about replacing them while GM is offering price match and $200 rebate. Looking at either another set of LS2s, Continental CrossContact LX20s, or Hankook Ventus STs. What do you guys think? Truck is a street queen and it doesn't snow down here. Just looking for a smooth and quiet ride, long life, and max MPG. 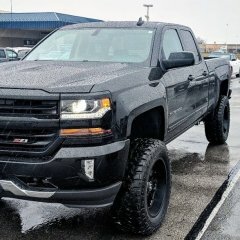 So I have a 2018 Silverado 5.3 Z71 LT and I've tried looking up threads for this topic before but for some reason I haven't had any luck. Ive had this truck for a year now and I had a level lift installed and my MPG stayed around 18-22 MPG and I could get 325-400 miles out of a full tank of fuel. I recently installed a 3.5 Rough Country suspension lift and I installed 20" wheels with 33" tires. I knew going into this modification that I would see a slight decrease in MPG but immediately after the install I dropped my MPG to 7.5-9 MPG and I cannot get it to increase AT ALL. I used to work at a GM dealership and spoke to a couple of old co-workers about this issue and for some reason we cannot pinpoint the issue. I know that increasing the ride height and the different wheel/tire package would create a difference but I didn't know that it would be this bad. I'm considering a performance chip and a CAI to try and increase my MPG, and its not a bad batch of gasoline and I've changed my driving habits and kept my foot off the throttle a little bit...if anyone has any info on this it would be greatly appreciated, thanks a lot!! Need skme help here. I have a 16 Silverado 1500 lt with the stock 17"wheels and 255/70r17 tires. Without a lift, or a level or anything. Can I upgrade to 18inch wheels and a set of bfg all terrain 275/70r18 without any trouble?? I have an age old question for everybody. 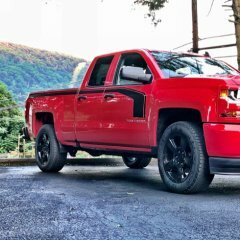 I have a 2015 Silverado w/Z71 package currently running on stock 18's. I want to upgrade to bigger wheels and tires preferably 22's or 24's. I know the biggest stock setup is 22's. My question is for anyone that has upgraded to 24's or just knows from general knowledge, if i go with 24's will I have to upgrade things like calibers, rotors, recalibrate my speedometer or anything else that i'll have to do by choosing 24's. I've heard so much i decided to ask in the forum to see if anybody can share their experiences/knowledge. I don't have any lifts not even a level kit yet but I plan on getting the level done soon as well in the front. From everything I've read i know 24's will fit i'm just concerned about any additional parts/maintenance they would require. Thanks! Information on Vibration Analysis and Diagnostic 2014/2015 Chevrolet Silverado and GMC Sierra This seems to be a vibration campaign that has been around since January 2015. I have seen many complaints on different forums about this issue. I also have a vibration/harmonics issue that is not there all of the time but most. My issue seems to be centered around the V4 decel, and body mount configuration. 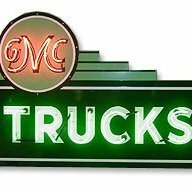 This link is filled with a ton of information about various causes and repairs many of the 2014/2015 GM truck owners are experiencing. Some may be experiencing a combination of more than one issue at a time. Many more may not be experiencing any vibration at all. I do believe for those folks with the "Cadillac ride" its only a matter of time before they start experiencing vibration/harmonics issues. Its kinda nice to get this information out so that GM can streamline the repair process even further. If enough of these trucks show up for repair request for vibration they may even send out letters to further enhance quality control. 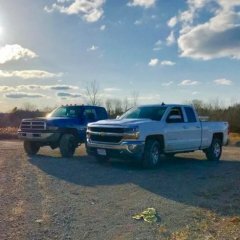 http://oemdtc.com/6392/information-on-vibration-analysis-and-diagnostic-2014-2015-chevrolet-silverado-gmc-sierra/3 If link does not work copy and past in your browser. Looking for the best online deal on wheels or even a wheel/tire package. Not sure where to look as this would be my first time making a wheel purchase online. Just purchased a 3.5" kit from rough country as well so I am open to ideas on size and offset. First time posting on this website but from what I've seen so far you guys can be very helpful!! 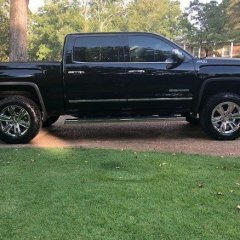 Hello all, I just purchased a 2017 GMC crew cab 4x4. I have had 7 F150's and finally nbit the bullet and went with this beauty! I do not want to lift it as to not void the warranty so I am just going to put a 2.5 inch leveling kit on the front. It currently has 275/55/20's on it. I am going with an all terrain tire on it and am keeping the factory rims for now. I will eventually get something with an offset so the tires will stick out from the fender well around an inch or so. So, with all that being said, what it the largest size tire I can go with right now without having to worry about rubbing issues? Can I do a 33x12.50x20? $1200 Just took these off to get the black edition 22s. Tires have 80% tread left, they are continental crosscontact lx20 275/55r20 Wheels are OEM chrome 20 inch denali wheels. No blemishes or curb rash, they are perfect. TPMS not included. Located in South Florida but am willing to ship at buyers expense. Wheel Size ? ? ? Just bought a 2014 sierra 4x4 and ordered the 2" kit to level it out. On rough country's website they say that this kit only allows for up to a 32" tire, and I am looking to put 33s. I am new to GM, what's the biggest tires that I can fit? Hi everyone, First off if there is a more appropriate place to post this please let me know and I'll be happy to repost! So to start off I have a 2015 Sierra 1500 with spacers on the top of the shock tower that create about 2-2.5" of lift and 3" rear blocks. I searched over multiple forums but couldn't find anyone with this exact issue. I went from stock 265/70r17 bridgestone duelers to 285/70/r17 Falken Wildpeak AT3Ws. Everywhere I searched it seems that plenty of people run the 285/70/17 KO2s with no issues with a level so I figured these would be the same, unfortunately at full lock the tire rubs on the UCAs. I was wondering what my options here are, the way I see it I have 3 options. 1. Downsize to 275/70/17 AT3Ws and get a little money back 2. Put some spacers on and hope that the UCA rub goes away and doesn't create a problem with the fender liner (I don't know much about these or how far I would have to go with them, I would prefer not to cut anything) 3. An offroad shop said that they could shave down the UCAs if they're the right material (I forget what kind I would need to have, I know that there are 3 different stock options for 2015). Any comments or suggestions would be appreciated! I have 30 days with the tire shop to decide what I would like to do, but I would prefer to get it done sooner so that I can stop worrying about it! Thanks everyone. How to fix pull to the right? So I'm getting ready to buy wheels and tires for my 2018 Silverado 1500 Custom Rally 4x4. Truck has the Readylift 2.25" level with UCA's. My plan is to run 17x8.5 offset 0 Method Race Wheels does anyone see a problem with this from my research they will clear the calipers. As far as tires my plan is to run 285/70/17 do you think i will have much rubbing issues? I don't want to have to do extensive trimming so i figured this would be a better option than a 33x12.50. Last question is what is your opinion on tires i was debating between the Falken Wildpeak at3w and the Atturo Trail Blade XT. Dont want anything like a mud terrian but want something a with a little more of an aggressive look truck will spend 85 percent of its life on the pavement so an all terrian or hybrid tire is my thinking. Thanks in advance. I have a 2015 Silverado cc z71 with a 2 inch leveling kit. I'm wanting to replace my 265 65 18 Good Year SRA tires that have 52,000 miles. I want a quiet tire. I was thinking of going up a size to a 275, but worried it may affect my mpg? What size and brand did you go with? Did it affect your mpg? 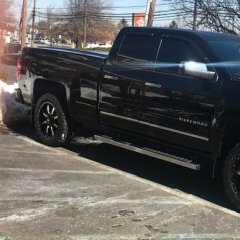 Thought I'd post a review of the newly installed suspension and wheel set up on my 2016 GMC Sierra Denali 1500. Previous set up was stock MagneRide suspension with ride height sensors and 22" stock wheels with Nitto Terra Grappler G2's size 285/45r22. I'm at 70k miles and the ride was steadily getting worse (too stiff), so I researched for a while and ended up installing the following: HaloLifts Boss Ultimate Kit (adjustable coilovers for 1" to 3" of lift in front, and 1" of lift in the rear) - http://www.halolifts.com/HaloLifts-Boss-Ultimate-Kit-fits-your-2007-UP-GM-SilveradoSierra-1500_p_220.html Stock GMC Sierra 18" rims (powder coated black) with Falken Wildpeak AT3W's size 275/70r18 Bypass sensor kit for all 4 MagneRide shock sensors and all 4 ride height sensors (I removed all ride height sensors that are mounted to the frame) - http://www.xineering.com/shocksims.html Up first, the HaloLifts Boss Ultimate Kit At $1299, this is a more expensive kit vs the Fox, Bilstein, or Rancho equivalant. What swayed me to this kit was that I was not looking for a crazy lift and I wanted something that was plug and play should I go a different route once these start to fail (like all shocks eventually do). Additionally, I found multiple reviews on this forum and other brand forums where people said they had installed Fox, Bilstein, and/or other brands and this was the best riding kit and worth the extra cash. You'll find a rep from the company, Alex, who's posted in this forum, as well as others, and he says call him with any questions. I did, and he answered every time and would not let me go until I had EVERY question answered. The customer service is outstanding with this place. I ended up going with the coilovers set at 1.5" of lift and I put .5" spacers beneath it to get 2" of total lift and the softest ride possible. Each kit is made custom to what you want, so that's how it arrived for me. You can have the coilovers set at 2" if you want, then add 1" of spacers underneath. Since I am only doing 2" of lift, I did not purchase new UCA's. Below are pics of me opening the packages. Again, thoroughly impressed with how sealed everything was with plenty of foam and cardboard to protect everything. Install was a breeze, thanks to instructions that were included and my convo with him over the phone. One last thing, the "do the rear shock boots go down or up?" debate has been settled. According to HaloLifts they go down :-) Next, the new wheel/tire set up I downsized from a 22" set up to an 18" set up so I could get more sidewall and a softer ride. While I like the look of a larger rim, it was so easy to get scratches on the 22" rims since they are so close to the ground and there's not enough sidewall on the tire to bulge out a little bit to help protect the rims. So, new set up gets me a softer ride and better rim protection. I went with a stock rim and had it powder coated black because I've had mixed experience with aftermarket rims (good and bad). As far as the tire choice, Falken Wildpeaks kept coming up as best all around value for it's performance. I've had KO2's in the past, as well as other AT tires but I wasn't blown away by their performance for how much you spend on them. Falken's were cheaper, but hold up well in rain, snow, and mud. Plus they have an aggressive look, that's a nice bonus. Below are pics of the truck with the new wheel and suspension set up. I'll follow that up with the obligatory, "pardon the dirty truck, haven't had time to wash it". Last, the MagneRide bypass kit This only applies to those who have the MagneRide suspension and ride height sensors (certain trims like Denali). If you do have it, you'll need to bypass the sensors or you'll forever be dismissing a message that says "service suspension system". If you can live with that, then ignore all of this. If it'll drive you nuts, you have 2 options - one cheap, but could lead to other issues and the other is not so cheap, but will not have issues. There are 8 sensors total, 4 shock sensors and 4 ride height sensors. The first option is to go cheap and buy 8 resistors (3 ohm, 25 watts). You then splice them in at every sensor. The risk here is corrosion, if you don't seal the splices properly this leads to the wire harnesses going bad and having to purchase all new harnesses and resistors to do all of the work again (and now you've spent more money on the harnesses). In all, this could run you about $50 for resistors, heat shrink, and a heat gun. The second option is to do what I did and buy the professional bypass kit from x-ineering. It's $425, but they'll give you a $75 discount if you post about your install on social media. I went this route because they clip in and seal the wiring, just like the stock sensors. No risk of corrosion and everything they make is backed by warranty. Overall, I'm super happy and love the ride. Only a couple hundred miles on it so far, I'll report back after all my Thanksgiving travel coming up (1500+ miles). Let me know if there are any questions! So I currently have a 2009 Silverado 1500 with 285/65R18 tires and 18/8.5 wheels with a 2in leveling kit. Im wanting to lift it and get some bigger tires without having to buy new wheels since mine are about a year old. Would a 6in lift and 35s look stupid since the wheels are smaller? Hey everyone I am new to this forum and tried my best to search what I was looking for but I am also a girl who’s not familiar with all these things. I have a Chevy 2011, 2 wheel drive with 18 inch stock rims. I was wanting to know what is the biggest size tire I can get that does not rub that would fit. It is not lifted or leveled. Thank you.